We had another expert in the PYP 3 classroom – Dr Rajni Chattaraj who shared her knowledge about the “superhero of the body systems” – The Nervous System. 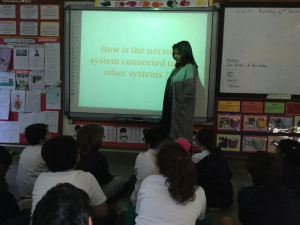 She helped the students understand how this system acts like the “boss” and controls the rest of the body in a child friendly way through videos, games and even a quiz at the end. Children learnt how certain actions such as the way we stand are voluntary actions whereas touching a hot item is an involuntary action. Through the game they learnt how messages are passed through tiny neurons (which make nerve fibres) to all parts of the body and from the brain and back. The quiz was perfect opportunity for the students to show how much they learnt, as both teams brought out their competitive streak to win the game. All in all, it was a fun and informative session which helped students understand this complex body system with ease. When Dr came I learned that the nervous system is the most important system in our body. The lesson was very interesting and gave me more knowledge on our nervous system. I also learned about what a nerve is made up of. I participated in the games that were organised by her. I really liked the lesson. I enjoyed learning about the different parts of a neuron like the dendrites, nucleus, axon, cell body. I also liked doing a game with the different nerves, the sensory nerves take the information and give it to the brain.